"[HORTON] Nathaniel, Esq., at Foster, in 89th year. American of May 25, 1819"
"Rhode Island, Vital Records Extracts, 1636-1899," indexed database and digital image, Ancestry.com (http://www.ancestry.com : accessed 27 April 2014), Volume 21, "Newspapers, Deaths, C-S," Rhode Island American - Deaths, page 277 (image 367 of 697), Nathaniel Horton death notice. 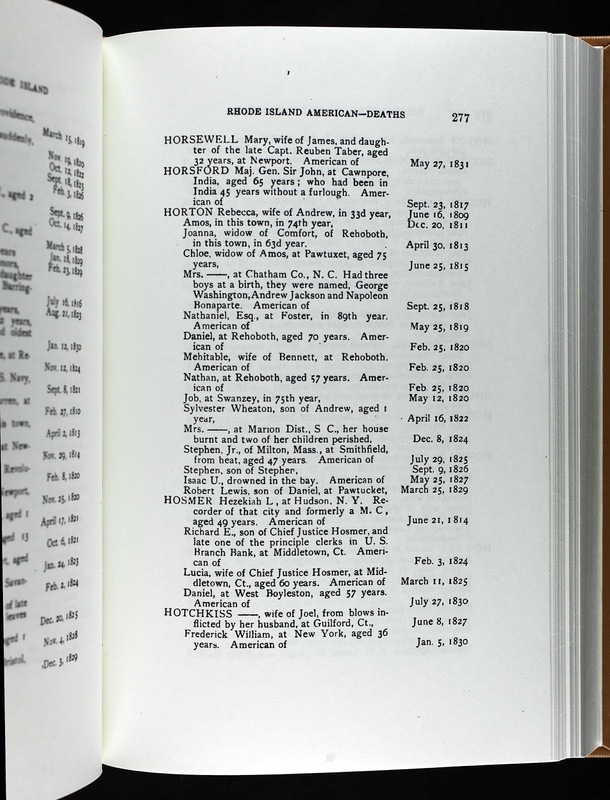 The probate records for Nathaniel Horton in Foster, Rhode Island Town Council Records indicate that he died 4 May 1819, and not 25 May 1819. The 25 May 1819 date is probably the date of the Rhode Island American newspaper issue containing the death notice. This death record is a Derivative Source record, with Secondary Information and Direct Evidence for the date and location of death of Nathaniel Horton. Nathaniel Horton (1730-1819) is my 5th great-grandfather. He married Sarah Pray (1734 - after 1819) in 1753, and they had 11 children. I descend through their 10th child, Phebe Horton (1772-after 1820) who married Simon Wade before 1790.